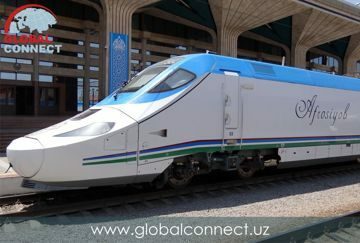 High speed rail in Uzbekistan currently consists of 600 km of track and services using Talgo 250 equipment, branded Afrosiyob by operator Uzbekistan Railways, on upgraded conventional lines. All HSR lines have been built using upgraded lines on Russian gauge. Other regional railways exist. 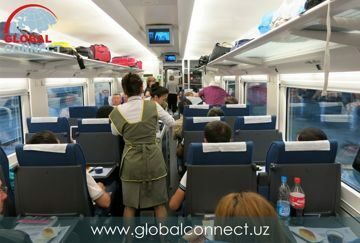 Tashkent–Samarkand high-speed rail line, opened 2011 using HSR capable trains while upgrading taking over 2.5 hours, in 2013 the 344km route full commercial speed taking 2 hours and 8 minutes. 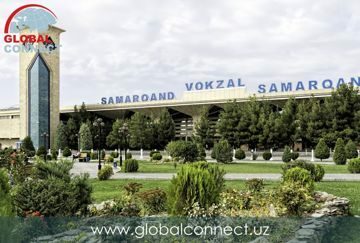 Samarkand-Bukhara high-speed rail line, opened Aug 2016, extension of the first line, 256 km taking 1 hour 12 minutes, or from Tashkent 3 hours and 20 minutes. Afrosiyob train has 2 VIP class carriages with 11 seats per carriage, 2 business class carriages with 26 seats per carriage, 4 economy class carriages with 36 seats per carriage and 1 bistro carriage.